An Unknown New Dimension! Pass through the Ultra Wormhole into a bizarre new Pokémon world, where familiar sights become strange and new powers are unlocked! Watch Necrozma's power grow, and marvel as brand-new Prism Star cards reveal their astounding effects on play. Meet Dialga-GX and Palkia-GX, and encounter bizarre Ultra Beasts and wild new forms of Alola's Legendary Pokémon. 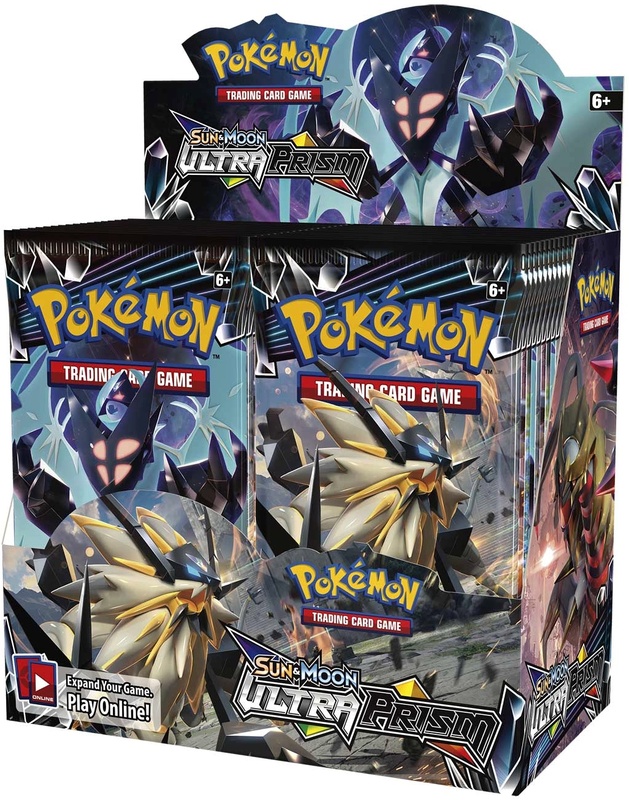 Explore a new dimension in the Pokémon TCG: Sun & Moon—Ultra Prismexpansion! 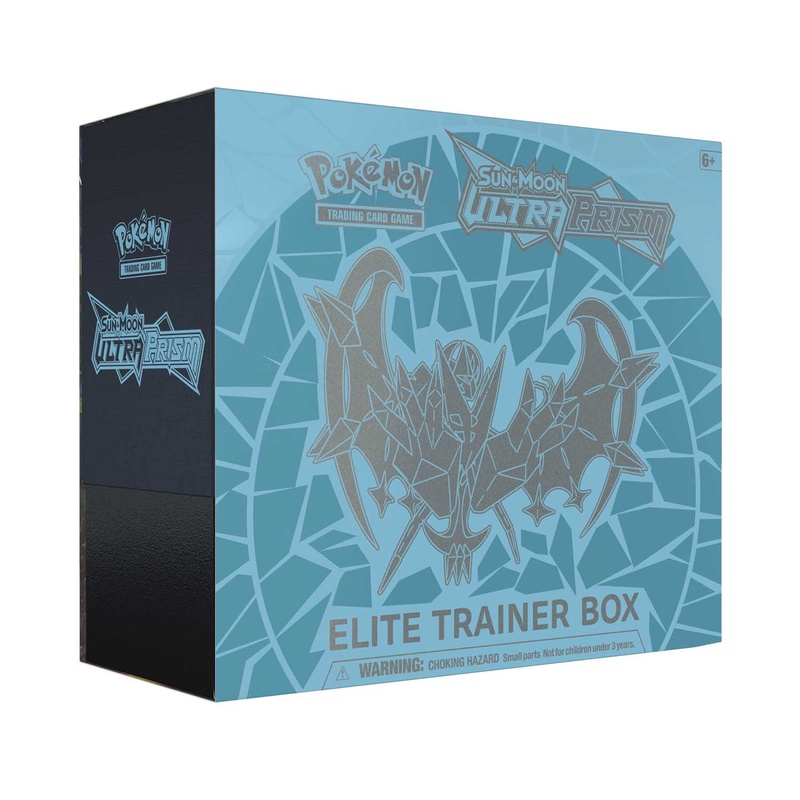 The Pokémon TCG: Sun & Moon—Ultra Prism Elite Trainer Box includes: 8 Pokémon TCG: Sun & Moon—Ultra Prism booster packs (each pack contains 10 cards and basic 1 Energy) 65 card sleeves featuring Dawn Wings Necrozma 45 Pokémon TCG Energy cards A player’s guide to the Sun & Moon—Ultra Prism expansion 6 damage-counter dice 1 competition-legal coin-flip die 2 acrylic condition markers and 1 acrylic GX marker A collector's box to hold everything, with 4 dividers to keep it organized A code card for the Pokémon Trading Card Game Online Cards vary by pack. An Unknown New Dimension! Pass through the Ultra Wormhole into a bizarre new Pokémon world, where familiar sights become strange and new powers are unlocked! Watch Necrozma's power grow, and marvel as brand-new Prism Star cards reveal their astounding effects on play. Meet Dialga-GX and Palkia-GX, and encounter bizarre Ultra Beasts and wild new forms of Alola's Legendary Pokémon. 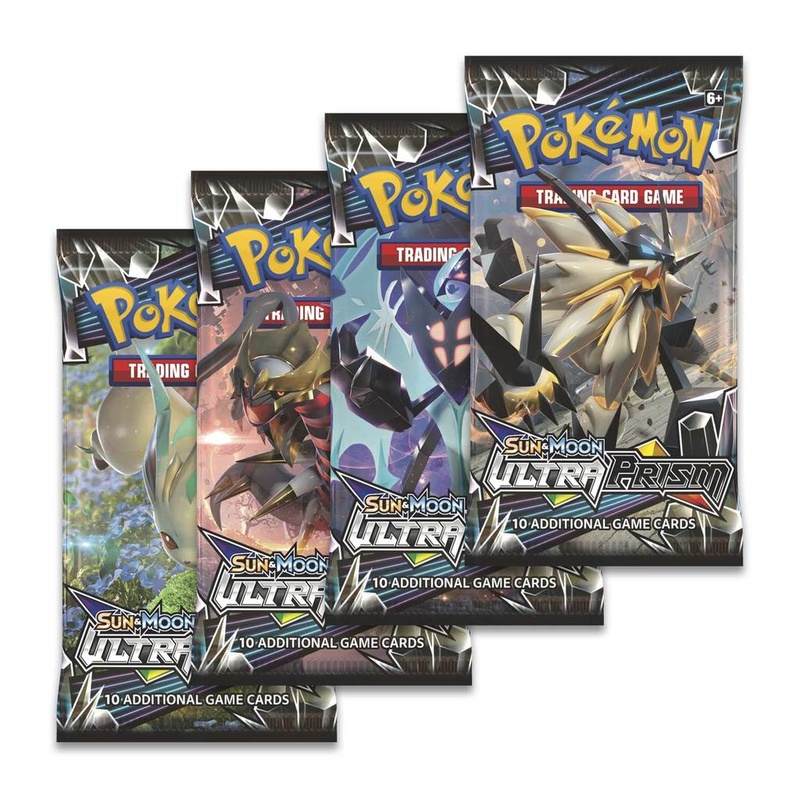 Explore a new dimension in the Pokémon TCG: Sun & Moon—Ultra Prismexpansion! 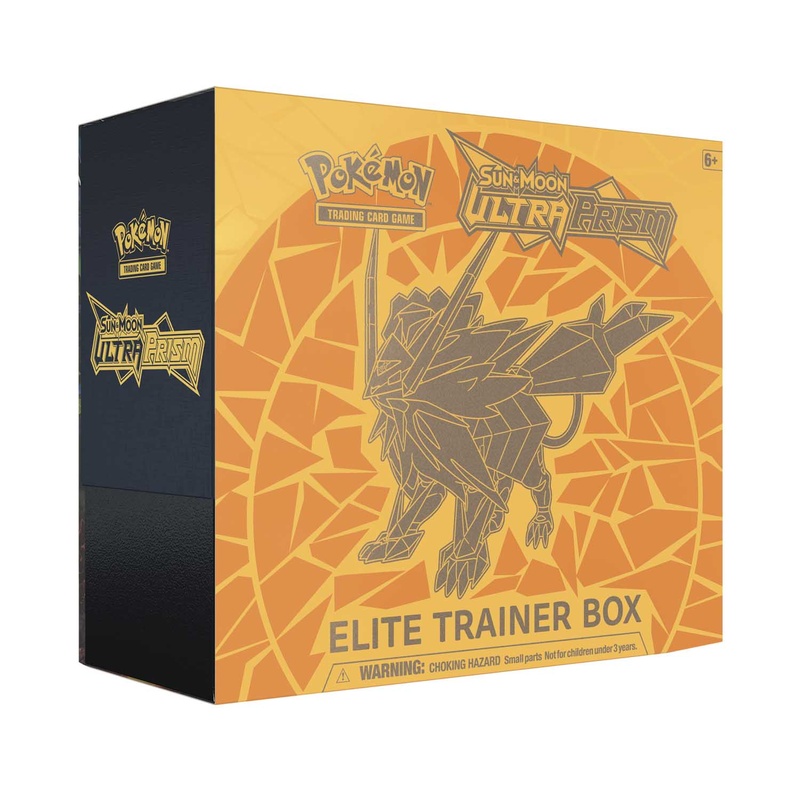 The Pokémon TCG: Sun & Moon—Ultra Prism Elite Trainer Box includes: 8 Pokémon TCG: Sun & Moon—Ultra Prism booster packs (each pack contains 10 cards and 1 basic Energy) 65 card sleeves featuring Dusk Mane Necrozma 45 Pokémon TCG Energy cards A player's guide to the Sun & Moon—Ultra Prism expansion 6 damage-counter dice 1 competition-legal coin-flip die 2 acrylic condition markers and 1 acrylic GX marker A collector's box to hold everything, with 4 dividers to keep it organized A code card for the Pokémon Trading Card Game Online Cards vary by pack.